is this where the new road is going? anyone have the route of it? It makes me feel sad as well, it's a pity they couldn't have incorporated it into the new plan. The occasional visiting warships certainly livened the place up a bit. Luco wrote: is this where the new road is going? anyone have the route of it? of a path up the Kelvin but its not on that map. 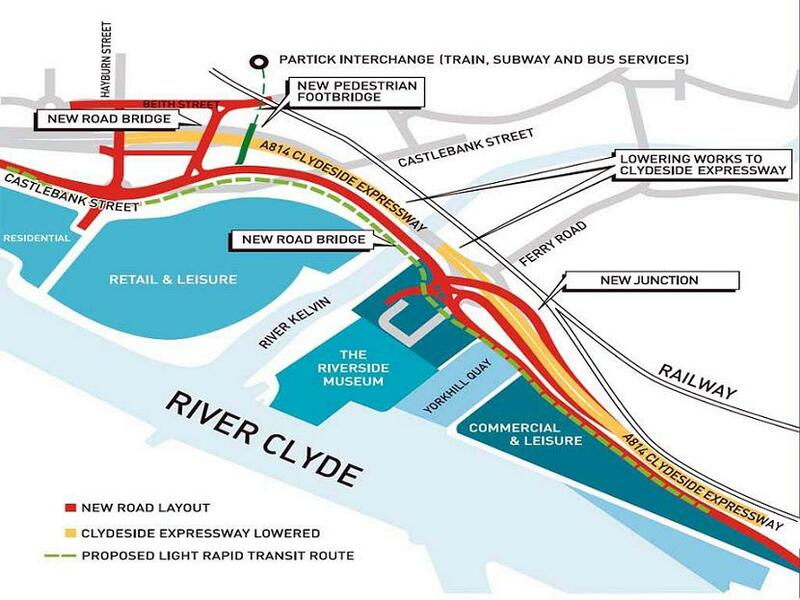 The continuation of the Kelvin Way down to the Clyde has been 'proposed', but the Tesco's Monolith if it goes ahead might make this about as attractive as a walk through a retail park. attractive as a walk through a retail park. Agree totally with Vladimir. All we ever get now is glass and steel arranged for the functional use of the retail trade. With flats that are outwith the financial reach of most who work in the associated retail developments. We should make use of the river, rather than turning our backs on it. It's a crying shame that so much industry has gone, and I'm sure that, with innovation, some could remain. I've already said on here that I'd hate that Tesco to be built, and I totally agree that there are far too many retail parks already. Surely saturation point isn't far off? Even in the city centre, the Sauchiehall St centre is all but gone and St Enoch's is pretty crappy, it seems a bit short sighted to keep building more in the suburbs. it seems a bit short sighted to keep building more in the suburbs. Ooops, maybe that was unclear - I meant build more retail parks. I think it'd be better if smaller independent retailers were encouraged to grow instead of plonking down a "supermarket in a box"
Regeneration isn't a bad idea in itself - it's necessary in some places cos they didn't do the planning job well enough in the first place. I meant build more retail parks. That is what I understood. The yards are doing OK at the moment, which is good news!